After we did a fun run of white backdrop baby pictures for this dude, we wanted to be sure Mom and Dad got some time to love on him too. Paige and Quinn just seem like naturals with this guy; they were so ready to have him join their family and can't get enough of him. (Me either. Aunt privileges!) We just hopped outside for a quick minute for a change of scenery. Pictures don't have to have elaborate outfits and locations to tell a story; they can, of course! but I love that the focus is right here on the love that is literally bursting out of these photos. 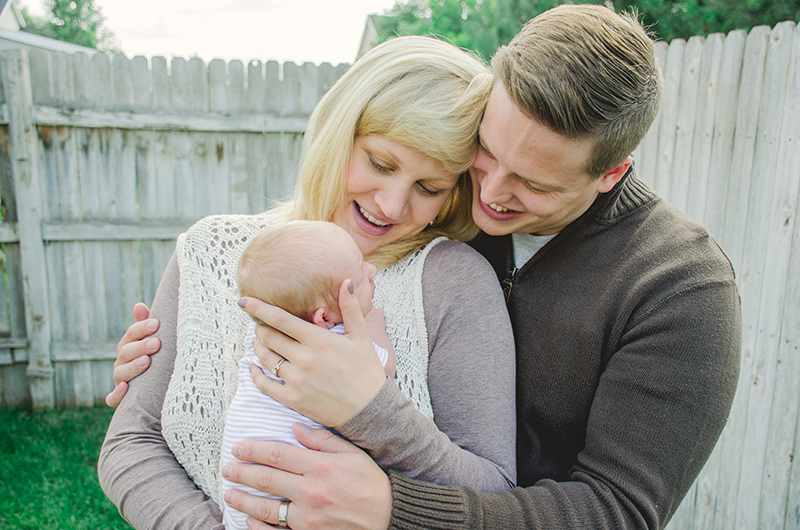 want to see your family through my lens? Let's chat! HE'S HERE HE'S HERE! Okay, he's actually almost a month old...but my nephew came two weeks early and I couldn't be happier. (I bet, somehow, his parents are happier still! haha.) As long as he's got a full tummy, this little man is happy as can be. Perfectly content to just quietly chill and nap. Who gets an angel baby on their first?! What a blessing. We were lucky enough to be at the hospital the night he was born, and from the first breath he's been a calm and happy human. We're so happy he's earth side. His blue hat and cotton swaddle are from Saranoni. Newborns are my favorite. Expecting? shoot me an e-mail! Know a family member or friend who is? Newborn pictures would make an incredibly thoughtful gift.